^ Vladimir Putin quits as head of Russia's ruling party. 24 April 2012 –通过www.telegraph.co.uk. ^ 5.0 5.1 Michael McFaul. The Putin Paradox. 美國進步中心. 2004年6月24日 [2011年1月26日] （英语）. ^ The World Bank in Russia ─ Russian Economic Report (PDF). 世界銀行. 2009年11月 [2011年1月23日] （英语）. ^ 10.0 10.1 Russians weigh Putin's protégé. 美聯社. 2008年5月3日 [2011年1月23日] （英语）. ^ Report for Selected Countries and Subjects. 國際貨幣基金組織. [2011年1月23日] （英语）. ^ Igor Fedyukin. Putin’s Eight Years. 《生意人報》. 2007年9月18日 [2011年1月23日]. （原始内容存档于2009年1月6日） （英语）. ^ Russia’s economy under Vladimir Putin: achievements and failures. 俄羅斯新聞社. 2008年1月3日 [2011年1月23日] （英语）. ^ Katya Malofeeva和Tim Brenton. Putin’s Economy – Eight Years On. RUSSIA PROFILE.ORG. 2007年8月15日 [2011年1月23日]. （原始内容存档于2007年12月22日） （英语）. ^ Mu Xuequan. Putin visions new development plans for Russia. 新華網. 2008年2月3日 [2011年1月26日] （英语）. ^ Putin said Stalin's legacy can't be judged in black and white. ^ 18.0 18.1 没有苏联的二十年（中文字幕）—在线播放—优酷网，视频高清在线观看. v.youku.com. [2017-03-27]. ^ 19.0 19.1 久加诺夫：欺骗的十年——普京执政10年总结 互联网档案馆的存檔，存档日期2014-02-21. ^ Russian Communist leader denounces Putin for US alliance. 互联网档案馆的存檔，存档日期2013-10-21. ^ 俄國總統普京80年代在前東德特工證件曝光. BBC. 2018-12-12 [2018-12-13]. ^ Archived copy. [21 February 2007]. Archived from the original on 21 February 2007. ^ 35.0 35.1 35.2 35.3 俄罗斯总理普京早年生涯. 腾讯网新闻. [2017-06-11]. （原始内容存档于2011-10-11） （中文（中国大陆）‎）. ^ Kovalev, Vladimir. Uproar at Honor For Putin. The Saint Petersburg Times. 23 July 2004. ^ Hoffman, David. 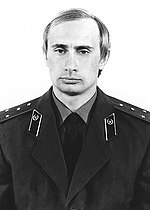 Putin's Career Rooted in Russia's KGB. The Washington Post. 30 January 2000. ^ 40.0 40.1 Владимир Путин: от ассистента Собчака до и.о. премьера. GAZETA.RU （俄语）. ^ 41.0 41.1 Pribylovsky, Vladimir. Valdimir Putin. Власть-2010 (60 биографий) (PDF). Moscow: Panorama. 2010: 132–139. ISBN 978-5-94420-038-9 （俄语）. ^ Rosefielde, Steven; Hedlund, Stefan. Russia Since 1980. Cambridge University Press. 2009: 139 [21 May 2017]. ISBN 978-0-521-84913-5. ^ Putin tightens grip on security. BBC新聞. 2004-09-13. ^ 俄罗斯首次修宪专为普京？. 新华网. [2008年] （中文（简体）‎）. ^ 普京当选总统迎来新挑战 能否遏制腐败有待观察. 南方日报. 环球网. [2012年] （中文（简体）‎）. ^ Putin Announces He Will Run For Reelection In March. RadioFreeEurope/RadioLiberty. 2017-12-06 [2017-12-13]. ^ It’s Official: Putin Says He’ll Run for Re-Election. Bloomberg.com. 2017-12-06 [2017-12-07]. ^ Walker, Shaun. Vladimir Putin makes it official – he's running for re-election in 2018. The Guardian. 2017-12-06 [2017-12-07]. ISSN 0261-3077 （英国英语）. ^ 70.0 70.1 2007年2月10日，普京在第43屆慕尼黑會議上的演講。 互联网档案馆的存檔，存档日期2008年05月4日，. ^ chinanews. 俄罗斯总统普京签署命令 成立克里米亚事务部-中新网. www.chinanews.com. [2017-03-27]. ^ Quetteville, Harry de. Vladimir Putin 'to wed Olympic gymnast half his age'. The Telegraph. 2008-04-17 [2008-04-17]. ^ Putin denies tabloid report that plans to marry former champion gymnast. International Herald Tribune. 2008-04-18 [2008-04-18]. （原始内容存档于2008-04-29）. ^ Andrew Kramer. Former Russian Spies Are Now Prominent in Business. 《紐約時報》. 2007年12月18日 [2011年1月28日] （英语）. ^ Anders Aslund. Russia's New Oligarchy: For Putin and Friends, a Gusher of Questionable Deals. iie.com. 2007年12月12日 [2011年1月29日] （英语）. ^ Путин под занавес президентства заключил мегасделки по раздаче госактивов "близким людям". NEWSru. 2008年5月13日 [2011年1月29日] （俄语）. ^ Private enterprise meets personality cult. 英國廣播公司. 2001年6月15日 [2011年1月29日] （英语）. ^ Anna Badkhen. CULT OF PERSONALITY SWEEPS PUTIN'S RUSSIA. pqarchiver.com. 2001年2月19日 [2011年1月29日] （英语）. ^ 莫斯科市长称普京是真正的男子汉和领袖. 环球网. [2012年] （中文（简体）‎）. ^ Dmitry Sudakov. Vladimir Putin’s trademark begins to decline. 2008-01-25. ^ Madslien, Jorn. Russia's economic might: spooky or soothing?. BBC News. 4 July 2007 [2010-03-02]. ^ «ИДЕАЛЬНЫЙ ПРАВИТЕЛЬ ДЛЯ РОССИИ - ВЧЕРА И СЕГОДНЯ». 2012-02-02. ^ Putin's performance in office — Trends. Russiavotes.org. 31 October 2007 [2010-03-02]. ^ Arkhipov, Ilya. Putin Approval Rating Falls to Lowest Since 2000: Poll. Bloomberg. 2013-01-24 [2013-06-22]. ^ Quarter of Russians Think Living Standards Improved During Putin's Rule. Oprosy.info. [2013-06-22]. （原始内容存档于2013-07-31） （俄语）. ^ Norman Stone. No wonder they like Putin. （原始内容存档于2010-05-25）. ^ Levada-Center -Description. Levada.ru. [2010-03-02]. （原始内容存档于2007-10-26）. ^ Russia through the looking-glass openDemocracy. "...while only about half of Russian households have a telephone line at home, well over 90% have access to the First Channel and Rossiya. And for a vast majority of Russians, they are virtually the only source of information about political events. 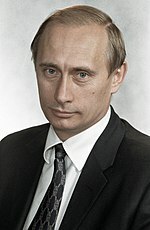 Given that typically well over half of their news broadcasts consist of sympathetic coverage of Vladimir Putin and members of the United Russia party, and oppositional figures are always presented in a negative or ironic light (if at all), it is unsurprising that the president is enjoying considerable popularity.". Retrieved 16 April 2008. ^ Did Vladimir Putin meet Ronald Reagan as an undercover KGB man?. The Telegraph （英语）.